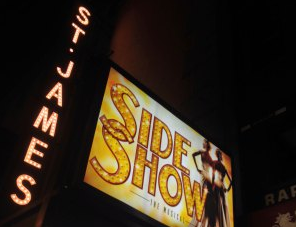 When Bill Condon — director of the two final “Twilight” movies — hosted a sneak preview of his upcoming Broadway revival, “Side Show,” some rabid fans of the vampire franchise tried to crash it. Security at the St. James Theatre (where theMichael Keaton movie “Birdman” was filmed) successfully stopped the “Twihards” from entering without proper credentials. But when Condon got wind they’d been blocked, he let some in for a peek at his show. “The fans got to watch the cast perform the opening number, ‘Come Look at the Freaks,’” a spy reports. Condon then even took a poll to get their thoughts. One favorite, we hear, in the show about conjoined twins in a circus, was a character called Dog Boy. You can read more about the Broadway Show and Purchase tickets at their site SIDESHOWONBROADWAY.